We sponsor a potluck on Saturday evening each time we do a Weekend Group Project. 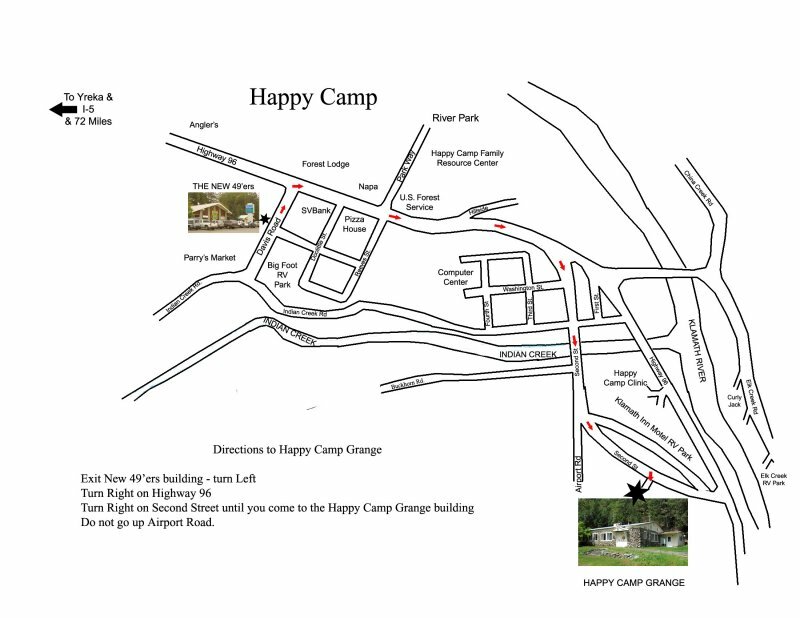 These events take place at the Happy Camp Grange. We begin at 6:30 PM. Everyone is welcome! Bring a meal to feed 5, and what you like to drink. Our Saturday night potlucks have been a part of every summer since the Club was formed. They are not only very popular because they give members a time and place to interact, and become friends; but because they give our members an opportunity to show how miners can help miners. We are quick to provide help to one another, share our knowledge to help solve a problem, and we will share quick tips and helps for problems specific to the area. They also provide an opportunity to let up a bit, for prospectors who come for short periods, as they attempt to work too hard, in general. This greatly decreases their efficiency. 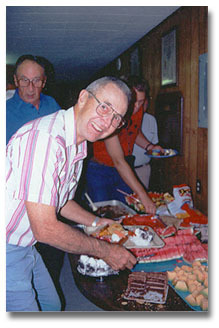 With people coming from all over the country and everyone contributing a big dish, the food is plentiful for guys that have been dredging all day, and people’s whose appetites have grown from all the wonderful outdoor exercise they’re getting. 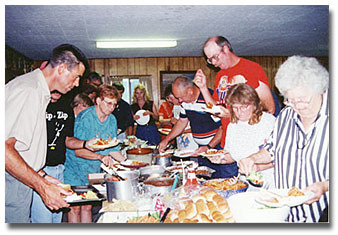 We rent the local Grange Hall for these potlucks. After a wonderful meal of potluck food, folks sit back, and Dave introduces the visitors or new members in attendance and where they are from; brings everyone up-to-date on any new gold strikes found during the last week on Club claims, and anyone present is welcome to show off their finds of the week, or any finds for that matter. Everyone loves to look at gold! Then, we have a drawing to benefit our Goodwill Fund. This fund is used to help people in the community who are in need; burned out, sick or hurt and unable to get wood, or any other calamity, and goes a long way toward building good feeling toward the large group of members and guests who invade this small town in summer. The drawing features items purchased by the Club, and some who are donated by Club members. Some of the most exciting are gold nuggets and nugget jewelry, when they are contributed. It’s a lot of fun, and once the regular festivities are over, people get together in groups to talk together about their week, or help someone solve a problem, or any number of other conversations. Then all go home to get a good night’s sleep knowing they’ll be energized by this break, and their prospecting will be more successful because of it. We are very happy that your group has an interest to affiliate with our program! Group affiliation entitles your entire group, or any portion of it, to schedule a single 2-week outing on New 49’er mining properties in Northern California. Affiliate members enjoy all benefits of full New 49’er membership during the time period that you participate in a group outing. You may prospect, mine and camp on New 49’er properties, subject to the guidelines everyone else follows, and may keep all the gold that you find. The cost for the group outing is $100 per person (which includes all family members, including children 18 years old and younger). MINING PROPERTY LOCATED NEAR HAPPY CAMP, CALIFORNIA: We make around 60 miles of mining properties available in Siskiyou County, California. Approximately half of this region’s mining property is on the Klamath River (in Northern California near the Oregon border). About half is on the creek and river tributaries to the Klamath River near the small, but friendly, full-service town of Happy Camp. Siskiyou County, where our Happy Camp facility is located, is one of the highest gold producing counties in California’s Golden History. However, because this area is several hundred miles away from the famous, but congested, Mother Lode area and any large cities, it has not been heavily worked by modern gold mining activity. The opportunity for mining success is excellent. New gold strikes are being made on a continual basis. Because of our abundant mining property reserves, the surface has barely been scratched. Most of our claim property has yet to be seriously tested or mined by our members, and we are adding more proven claims on a routine basis. TYPES OF MINING PROPERTY: Our members have access to miles of beautiful creek property on the forks of Elk Creek, Indian Creek, Thompson Creek and the Scott & Salmon Rivers-all proven in their gold production. Depending upon the claim location, water depth can be from inches deep to ten feet deep or more. Streambed material depth can be the same. There are some areas with a great deal of gold-catching bedrock showing. Gold deposits in creeks tend to be more spotty and inconsistent than deposits on the river properties. Creeks (and the smaller rivers) tend to pay better in and around the boulders. Creek miners should come prepared with boulder moving equipment, like a come-along, Griphoist or power winch. Upon the miles upon miles of Klamath River claims we make available, water depth can be from inches deep to 20 feet in some locations. Streambed material depth can be the same. We have an enormous amount of property available on the Klamath for all different types and sizes of operations. 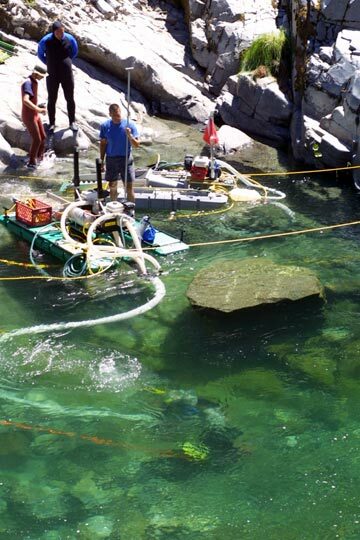 While the Klamath is a fair-sized waterway, members and guests have found an abundance of mining areas suited for panning, sluicing, crevicing, electronic prospecting, and dredging with the dredge size ranging from the smallest of dredges to 8 inches and larger. ACCESSIBILITY: Most of these claims are near roads which parallel them, and are reasonably accessible. Under most conditions, 4-wheel drives are not needed. However, some people do like to get off by themselves, and we have plenty of property which will fulfill their needs for solitude and serenity. THE OTHER SIDE OF THE RIVER: There is a lot to be said about bringing a small boat or rubber raft if one is available to you (also available from the store in Happy Camp). To a large extent, the far side of the Klamath, Scott & Salmon Rivers has yet to be prospected and mined by our members. Some of the best finds these days from the gravel and moss outside of the river with the use of sluices, vacuum-mining and panning are coming from the far side of the river. A good rubber raft will also be helpful to get into some of the more remote sections of the Salmon River. GUARANTEES: We recommend all beginners start on the river claims, rather than on the creeks. The consistent gold reserves of the Klamath, Scott and Salmon Rivers guarantee that everyone is going to recover some gold if they get out and give it even the smallest amount of effort. While some of our more experienced miners have done well on the creeks, and the creeks show fantastic potential, people consistently do so well on the river claims, that we find most of our members and guests end up mining and prospecting along the river instead of the creeks. 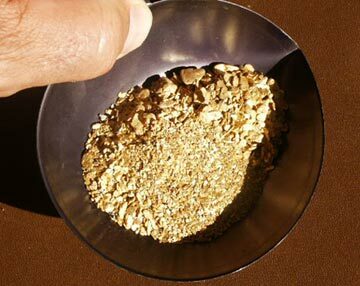 Experience has shown that the key to successful gold mining is in learning how to prospect for acceptable gold deposits. This is also true on our mining properties. WEEKEND GROUP MINING PROJECTS: The New 49’ers sponsor weekend group projects to affiliate and other members on a continual basis. These consist of 2-day group surface mining (out of the water) projects and week-long group surface or dredging programs that are scheduled during the time periods when affiliate group outings are planned. 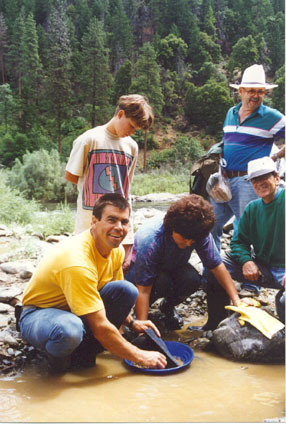 The 2-day group programs include information on prospecting for gold with hands-on experience in panning, motorized sluicing, sampling techniques, and important information on how and where to find gold along our properties. These programs include an exciting, fun-filled, and information-packed outing on our mining properties. This is a fun and exciting group surface-prospecting operation where participants each receive an equal share of the gold recovered. The 2-day projects are always scheduled to occur during the first two days of an affiliate group outing. This is to help affiliate members off to a good start in understanding how to find gold on our properties. There is no extra charge for affiliate members to participate in a 2-day project during a group outing event. Dave McCracken’s week-long group mining projects are purposely scheduled during the second week of most affiliate outing time periods. 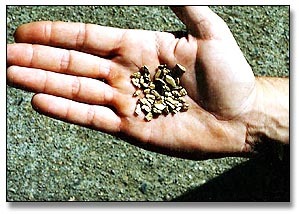 This optional program is for prospectors who want to go for the gold on a more serious level. We will provide all of the mining gear to support these group projects, including commercial rubber rafts to gain access to remote areas of the river properties where the prospects are excellent for high-grade gold. Click here for Dave’s schedule and costs of week-long projects. There is a $100 discount for New 49er affiliate members. It takes a non-refundable, advance payment of $100 to guarantee a place on a specific project. Dave only accepts a limited number of individuals (or couples) on each 7-day project. So if any affiliate members are interested, we advise you to schedule without delay. More information about Dave’s week-long group mining projects is available upon request from the Club office. CAMPING: The New 49’ers program with the U.S. Forest Service on the Klamath River and its tributaries allows our affiliate members to dry-camp on many of our mining properties for the full two-week outing extended, providing you maintain a clean, sanitary camp and are actively mining on our claims. We have designated New 49’er campgrounds which are on and near our claims. Most of these camps are readily accessible to 2-wheel drive vehicles as well as RV’s. We have a great deal of space for RV or tent dry-camping. There are also full-service trailer parks, motels, and home and trailer rentals in the immediate area for those who prefer full service accommodations. Most have very reasonable rates, and some extend discounts to New 49’er members and guests. We recommend you inquire and make reservations well in advance for private facilities to ensure that there is a space ready for you when you arrive. SANITATION: When camping on our claims, all grey & black water must be hauled to an approved dump station in town (RV parks will allow you to dump for a fee). No holes or latrines are allowed for black water. Portable holding tanks and port-a-potties are acceptable, provided they are dumped in approved stations in town. All members and guests MUST come prepared with some type of approved sewage disposal plan if they intend to camp on our properties. We do place chemical toilets in our main, more heavily used, camping areas during the spring, summer and fall months. Members and guests are required to provide their own tissue paper. Otherwise, sewage disposal is the responsibility of each member and guest. Portable tanks, garbage and potties are NOT to be dumped into our chemical toilets. LIABILITY: Each affiliate member is required to sign a membership agreement prior to engaging in any mining activity on any property administered by The New 49’ers. This contract places complete legal and financial responsibility for individual mining or prospecting operations and activities on the individual member or guest. Gold mining sometimes requires moving equipment over rough terrain and obstacles. Some mining is done in the water. Safety is a personal matter, based upon the judgment of the individuals involved and depending on their experience. Final responsibility must fall on the individual, because New 49’ers staff are not present and are restricted by our policy from supervising any individual’s operation. This membership agreement is available from our office upon request. RULES: We have also published a thorough set of operation rules for all members and guests to study. These are very reasonable, common sense rules which are necessary if we are to get along with one another, the local residents, and the authorities. These rules are necessary to the continued growth and successful operation of our organization. In the Happy Camp area, we have a very good relationship with the Department of Fish and Game and the U.S. Forest Service. In the past, they have assisted and supported our activity. This assistance exists largely because they know we are a well organized and responsible group. Operation Rules are available from the office upon request. COMMERCIAL STATUS: All dredges with hose sizes larger than 6 inches in diameter are automatically considered commercial, and are required to pay the New 49’ers a 10% royalty of their gold recovery, regardless of how much or little they are finding. This 10% royalty is paid on a weekly basis. Operating commercial equipment on all of our properties requires special permission from management and involves a special commercial contract. All dredges 6 inches (hose size) and smaller are classed as prospecting and are permitted on all of our mining properties. They are allowed to keep all the gold they find. CLAIMING DEPOSITS: Affiliate members have the right to prospect and mine anywhere along the mining properties we make available as long as their activity does not seriously inhibit the mining operations of someone who was mining in the area first (members or guests). If a member locates a deposit along the mining properties we administer, he or she has the right to claim it-or at least a portion of it. Any single membership is entitled to claim 60 linear feet of the creek or river at one time. This claim would cross the entire waterway on the creeks, Scott or Salmon Rivers. On the Klamath River, when dredging, this entitles the member to 60 linear feet of the river, from the bank to the river’s center in most areas. It does not include up on the bank for surface mining activity unless someone in that membership (spouse or children) is actively mining on the surface. A surface claim (claim up on the bank) is a little different. A person working the bank is entitled to claim a 30 foot radius from the location he or she is actively mining. If you are there first, and another member or guest wishes to work in the area, please mark the 60-foot circle boundary so they can see where your claim ends. A person must be actively mining or be actively moving equipment to the location in order to claim it. Equipment sitting idle for a week or more constitutes abandonment of any right to claim that area until the person resumes mining activity. If another member starts mining activity in any area abandoned by someone else, the new person has a right to claim it. DREDGE AND EQUIPMENT SIZE LIMITATIONS: On our creek claims and the Salmon River in northern California, we have limited dredge size to 6-inch (intake hose size) dredges and smaller. This is to prevent larger production dredges from degrading water quality downstream. On the Scott and Klamath rivers, dredges are allowed up to 8-inches in nozzle intake size. DREDGING SEASON: You can obtain a standard suction dredging permit from any California office of the Department of Fish and Game. More information on the permit can be found here. The exact cost of the permit changes slightly each year. The permit allows you to dredge on any waterway open to dredging within California. We have permit forms available at the office if you want to apply through the mail. If you send for the permit from Happy Camp, you have to expect a waiting period of at least three or four working days before you receive it back by mail. Only those persons actually operating the suction nozzle of a gold dredge in an active waterway in California are required to have a Fish and Game dredging permit on hand. Before filling out your application form, you might want to look at the example we have posted here. This permit allows you to dredge on our Klamath River claims below the mouth of the Scott River on a year around basis. It allows you to dredge on our Scott River claims, & Klamath River claims above the mouth of the Scott River, from the 4th Saturday in May through September 30. It allows you to dredge on our creek claims from 1 July through 30 September. The Salmon River is open to dredging between July 1 through September 15. The permit allows up to a 6-inch dredge on the creeks and the Salmon River; and to an 8-inch dredge on the Klamath and Scott Rivers. SEASON FOR MINING ABOVE THE WATER: Pick and shovel-type above-water prospecting activities can be done on the creeks and rivers even during the non-dredging season; but no silt whatsoever can be washed into the active waterway from water directed up onto the stream bank using a motorized pump. Silt and other material from surface gravels (up on the bank) must remain up on the bank, and cannot be washed into the active waterway at any time. Happy Camp has a dry, hot summer and a moist, cool winter season. It seldom snows; and when it does, it usually melts within a few days. 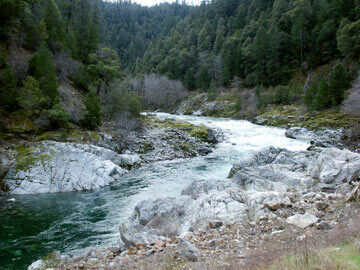 River water temperature drops to about 40 degrees during the winter months. During the summer, it runs in the mid-to-high 70’s. 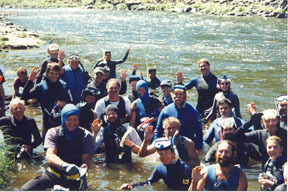 Some members dredge the Klamath River throughout the winter months, using dry suits or hot water systems. We also have members who do surface (out of the water) prospecting activities during the winter months in the Happy Camp area. However, the Arizona winter weather is better suited for outdoor activity during the winter months. In Happy Camp, our season gets busy from early April into November, since this is when most members make use of this area’s mining properties. GETTING TO HAPPY CAMP: Happy Camp is located about 65 miles to the to the west of Interstate 5 on Hwy 96 in Northern California. We are about 40 miles from the Oregon border. Our headquarters is located at 27 Davis Road, next to the Post Office in Happy Camp. If you arrive when the office is not open and you plan to camp on our mining properties, it is recommended that you spend the first night in Curly Jack Campground, a USFS campground located just west of town or on our K-22 claim just downriver from Happy Camp..
Be sure to get a campfire permit from the local USFS office, located right in town, before you have any campfire. CAMPFIRE PERMITS ARE REQUIRED ANYWHERE IN THE AREA. Upon arrival, our office staff will register you and help you with any information or assistance you need. WHAT TO BRING: Casual, comfortable clothing, shoes, boots or sneakers you don’t mind getting wet and to scramble around the rocks in, a hat to protect your head, sunscreen, and a water container to carry. If you are coming to a weekend seminar, the motorized sluices used will be provided. It’s best that you bring your own shovels, picks, gold pans, and other individual prospecting tools. Gold pans and small items are also sold at our store in Happy Camp. If you are coming to work on your own, you will need to provide all your own equipment. Everyone needs to provide their own transportation, lodging and all meals. FRESH WATER & SEWER DISCHARGE: Affiliate members are welcome to take the water they need from the garden hose provided at the front of our office location in Happy Camp. Each of the RV parks in town offers a dumping service for a fee. Probably the easiest place is at the Klamath RV Park located just off of Hwy. 96 just down river from Happy Camp. OTHER FACILITIES IN HAPPY CAMP: Happy Camp has a grocery store, gas station (card lock), several motels and private RV parks, a bank, a post office, a liquor store, several restaurants, a hardware store, several automotive repair shops, an auto parts store, two beauty salons, a medical clinic, physician, and generally has everything a person or group will need. We also have the largest showroom of small-scale mining supplies and equipment in America. A standard 10% discount is automatically extended to every affiliate member who buys from the Pro-Mack store. Since the business community benefits greatly from income provided by members of The New 49’ers, and since our membership consists of people who are pleasant to be associated with, we are generally well accepted and supported by local communities. We have a cooperative relationship with local law enforcement, and members of our Club are active in the local Lions Club, the Chamber of Commerce, and other local church and civic organizations. Note: We can plan your outing better if we have an estimate in advance of how many dry-camping areas your group will be needing to facilitate your group. Final numbers can be adjusted at the time of arrival. Upon arrival, we require a list of all affiliate members who will participate, and we would prefer that an organizer from your group collects the $100/family and works with our office to register your entire group all at once.